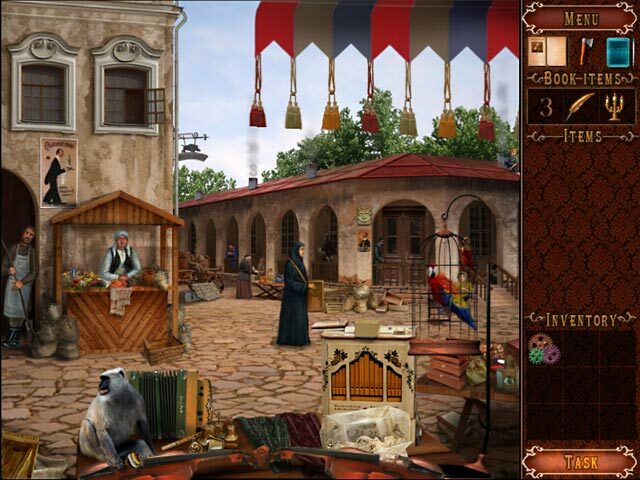 PC Games > Hidden Object Games > Crime and Punishment: Who Framed Raskolnikov? Crime and Punishment: Who Framed Raskolnikov? is rated 2.8 out of 5 by 11. Rated 4 out of 5 by mrm2006 from A Dostoyevsky book inspired this game. Crime and Punishment. All the angles, tangles, crime and mystery you could want in one great game. I was immensely surprised how much I liked this hidden gem of a game. Storyline: You and Kat, 2 experienced detectives from the 21st Century go back in time to the 19th Century to investigate a murder. Graphics: Poor. Looks very hand-drawn and water-colored - almost by an amateur. Disappointed. Sound: Nice background music. Nothing disruptive at all. Game Play: Once you have traveled back in time to the proper place, hours before the commitment of the crime, your investigation begins by going through the alleged criminal's home and belongings. You find clues which lead you to various establishments and speak with characters who require you to complete quests (help in finding items) before being offered something that may, or may not, be a helpful clue. You offer the alleged criminal money but he refuses it. So, why is the Old Woman/Pawnbroker murdered? If not for money, then why? And by whom? Play this mystery game to find out these answers and more. HOGs: This game is nothing BUT HOGs. You must find items in every location. In fact, you must go through several lists of items before gaining an inventory item/clue. Unfortunately, the items are tiny and placed around a monochromatic display of hundreds of items. So, very difficult to find. Mini Games: Few and far between. Most of the time, the instructions are too vague and you have to figure out how to play the game - but once you do, all the pieces fall together quite nicely. Hints: Not rechargeable. You are given ONE hint per level. Each time you are given an itemized list you have the opportunity to find an axe to obtain an extra hint. Almost impossible (see "Graphics" above). I dislike games of this kind and, as a matter of personal choice, never purchase them. There is only one mode of difficulty to play. You are armed with a "computer" that contains notes from each level played as well as conclusions drawn. If you find 3 items in each level (a feather, a letter of the alphabet and a candelabra) you will have the opportunity to read a chapter in a "book". All in all, this Glam-ma was extremely surprised that I enjoyed this game so immensely that my reaction at the end of the free demo was, "NO!". Unfortunately, due to 2 pet peeves I won't purchase the game. One - having to earn extra hints, and Two - HOGs that are so dark, dreary and over compensated with items (hundreds) that it is virtually impossible to find the items on your list. However, because this is such a surprising gem of a mystery game, this Glam-ma kindly requests that you at least give the free trial a try. It's an hour and it's free. Who know? Maybe the intrigue, mystery, suspense and storyline will overbear my 2 pet peeves. The review of this game is based on this Glam-ma's opinion - and only mine. Therefore, if you found this review to be helpful, please click on the "yes" button below. There is also a "no" button. Seriously? You'd give your Glam-ma a "no"? Kidding. Happy Gaming! Rated 4 out of 5 by rosekaufmann from GOOD UNTIL THE END Finished game in a little over 4 ½ hours. I have a touchscreen, but found no option for a cursor (which I prefer). Might be 1/2 hour less with cursor since you would have a changing cursor. You don current local garb as you investigate Rodion’s motives for possible murder. There are several locations with cutscenes between changes in locations. HOS encompass the entire location. A couple HOS words were obscure – such as “bones” were actually dice. Puzzles were relatively easy; a few were time consuming. Find an axe for an additional hint, and a pen, letter and candelabra on each level to restore pages of the story. Story of who murdered a poor old woman (who was actually quite rich) was interesting, but why she was murdered was even more so. Didn’t care much for the ending – seemed it was missing something. Rated 4 out of 5 by coolang1989 from REALLY COOL GAME When you play through a scene in this game you have to do a series of things leading up to solving the scene itself. There are also three book items to find in each scene also. Find the three book items and unlock a new chapter in the book. I enjoyed this game although some of the objects are small. The puzzles weren't too hard to solve but were fun to play through. I wish it was a little harder because i thought this game was pretty easy. Rated 4 out of 5 by catbag8717 from Overall, A Decent Game I decided to give this game a try after seeing the review, and I actually liked it! 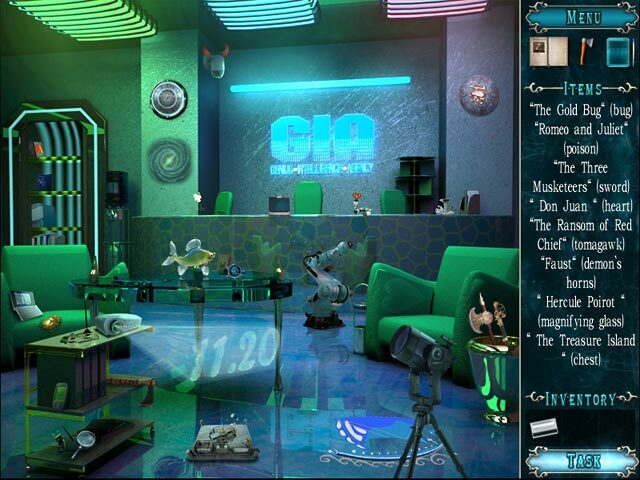 Good Parts: The Hidden Object Scenes. I hardly needed to use any hints at all, as the objects were really easy to find. Pretty good graphics. They could use a little improvement but they were stil clear. A really good storyline. Still should've had some voice-overs though. I really enjoyed the way the game was set out. It was basically just find the Hidden Objects. With other games, this annoyed me, but with this one it seemed to work really well. OK Parts: Voice-overs would've made the game more interesting. The intro wasn't as pleasing as it should've been. Bad Parts: Limited hints really annoyed me. Once you used your hint, you had to wait for it to recharge. This was un-necessarily long and annoyed me so much!!! Overall, I thought this game was interesting, but it's missing the wow factor. Recommend it to anyone! Rated 4 out of 5 by Rebr2009 from For Dostoevsky's fans ! A game that takes you inside the classic novel "Crime and Punishment." Well, I'm a big fan of Dostoyevsky's books, so I really enjoyed being able to talk to Raskolnikov, enter his room, the bar, and even play with him. Cutscene from the beginning is like a book and introduces the characters. After that, you're in 2058 and will make a trip back in time to unravel the reasons of the murder. The game itself is not very appealing to anyone who has not read the book, since the atmosphere - extremely well reproduced - of St. Petersburg in 1866 is dark and mysterious, and for being a classic novel, has no "special effects" or great adventure as current games. The game is not challenging, nor in the mini games or in HOS, except for the size of some objects to be found. In each scene you have to collect an ax (to earn hints), and: a letter, a candelabra and a feather - to restore book pages. Anyway, I really liked, so I bought the game, more because of the story than the game itself, and I had a great time! Rated 3 out of 5 by hermitcave from Only an OK game for me Apparently this was based on a Russian novel but I did not find the story interesting and only completed it because I play every game I buy to the end as long as I don't have a lot of glitches or technical issues. The cutscenes appear to be all hand drawn and more sketches then pictures. The basic game is the HOS and there were plenty of them. Most were clear enough to find the objects but many objects were hard to determine what they were and were often found just by clicking on something that stood out. There were times when you were presented with a scene but no list of objects so you had to search for the spot where the cursor changed to an eye to discover something that brought up the list. There was a task button but it was of little help as it only gave a basic task such as "open the door." The hint system was limited as you had to find axes in each scene that gave you more hints. The story was apparently fleshed out (uncovered) by finding feathers and candleabras. The story concerned a murder of an old woman and you have to discover who did it and why. If you like HOG this one will take up an afternoon. Rated 3 out of 5 by Hookedonbigfish from Who framed ?????????? I haven't read the book and I am unfamiliar with this case in history and after playing this game it will stay that way. The plot is that you have to travel back in time with two investigators Alex and Kat to find the motives behind the heinous murder of an old woman. The dialogue was a bit tedious with loads of Russian names that looked like alphabet soup that took forever to try and pronounce and most of the dialogue did not stay visible long enough to read and take in and allow you to understand the generat gist of the game. The graphics were rather dark and dingy and the cut scenes were not very expertly drawn, which made most of the hidden objects very hard to find. The puzzles, however, were quite straightforward and did not present much of a problem. The story line was probably quite feasible but as I said I have not read the 'book' and can not comment on the authenticity. A reasonable game but not one of the best by quite a degree. 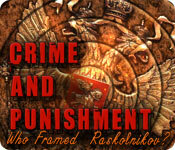 Rated 2 out of 5 by pennmom36 from Crime and Punishment: Who Framed Raskolnikov? 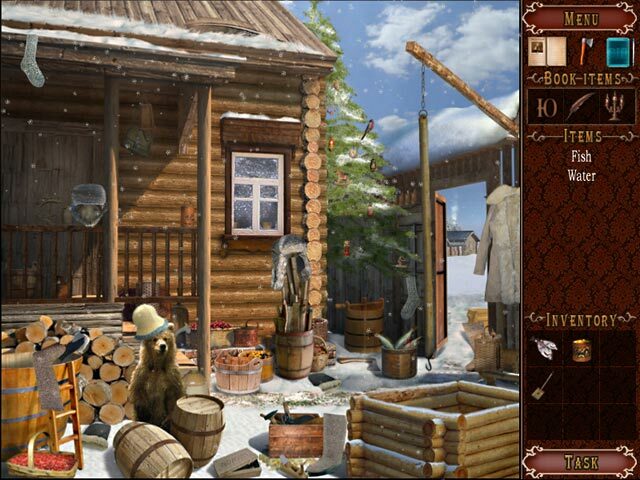 This is a Hidden Object Game based on the novel, Crime and Punishment by the famous Russian writer Fyodor Dostoevsky. I haven't read any of these novels myself and that may be one of the reasons I couldn't connect with this game. The year is 2058 G.I.A which stands for Genius-Intelligence-Agency. Agents Alex and Kate have been assigned to investigate Rodin Raskolnikov who has been accused of a murder. Alex and Kate jump into the G-I-A's company time machine and head to St. Petersburg Russia in the year 1866, completely adorned with clothing from that time period, such magic! One thing that totally annoyed me was the fact that I had to watch the credits before the game started and from what I could tell there was no option to skip this feature. Each scene has hidden axes to find for extra hints, a letter of the alphabet, a candelabra and a feather, which will restore the pages of the novel (one page at a time) There are a few interactions available in each scene such as zoomed in areas or locked drawers which require you to find and use keys for example. The HOS are mostly simple list finds or "find 12" object that are marked with red stripes, or 15 gold items. Some items are stored as inventory to use in that scene or the next scene. Other than the fact that you can travel to different countries and different time periods, there just isn't anything to keep your interest let alone keep you on the edge of your seat. I'm not even sure this game would interest me even if I had read the book, making this a no go for me. Rated 1 out of 5 by RavynWytch from Ew. Absolutely hated this. The gameplay was awful. Hints charged very slowly. Graphics were so-so, very in-line if you apply it with the story line. Don't waste your time with this one. Rated 1 out of 5 by DiDi212 from It's a Crime to Purchase and Punishment to Play! I only played 28 minutes of the demo. What an awful game. It's mainly just HOS where the items are so tiny, I ended up clicking on items I couldn't recognize just to try to finish the scene. You also have to find an ax, for hints, a feather, a candelabra, a letter of the alphabet, and a book in addition to say 15 objects of gold, or a mixture of junk items, which may contain a specified number of one type of an item. Each scene takes some time to load, There are no voice over and no map. I didn't play any puzzles. The visual is dreadful, just poorly drawn scenes. I didn't have fun at all. I enjoy a good HOS where you really have to look to find items, but the items were so tiny, some were just impossible to find. Where is the fun in that! I believe the negative reviews have nailed this game as a no buy, it is certainly a no buy for me. Please play the demo and read some reviews. I noticed this game has few reviews and no 5-star ratings. I've never seen a game with no 5-stare ratings and that should scream "rotten game".